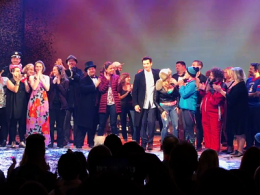 With its opening night performance just hours away, the Broadway production of the new musical Groundhog Day has released its first footage. Inspired by the 1993 motion picture and featuring a book by Danny Rubin and score by Tim Minchin, the show stars Andy Karl as a cynical weatherman who is forced to repeat the same day over and over. Check out highlights below.